TurboTax Online: Do You Know Where Your Data Is? As more people turn to the Web for help in preparing and filing their income tax returns, some familiar sites continue to beef up their offerings in hopes of attracting newcomers and enticing competitors' customers. Most of the five online tax-prep services we looked at--versions of CompleteTax, H&R Block at Home, TaxAct, Tax Brain, and TurboTax that include guidance for individuals as well as for investors and sole proprietors--now support importing at least some (but regrettably not all) data from a PDF (the most common format for saving a return created online) of your 2010 return. This makes switching services easier than ever. Also new: A couple of sites offer dedicated iPad and/or iPhone apps (see "Tax Prep? There's an App for That, Too")--or at least have eliminated technologies such as Adobe Flash that, in the past, precluded using the site on an iOS browser. The overall competitive landscape for tax preparation sites hasn't vastly changed since last year, though. Intuit's market-leading TurboTax continues to charge a hefty premium for its excellent interface, extensive data importation support, and considerable guidance--which for the first time includes unlimited one-to-one access to a tax professional via phone or chat. This move appears to be a response to H&R Block's ongoing leveraging of its brick-and-mortar tax-prep operation to enhance its online product, which is solid and moderately priced, but doesn't quite match TurboTax's ease of use, especially in its Schedule C business area. 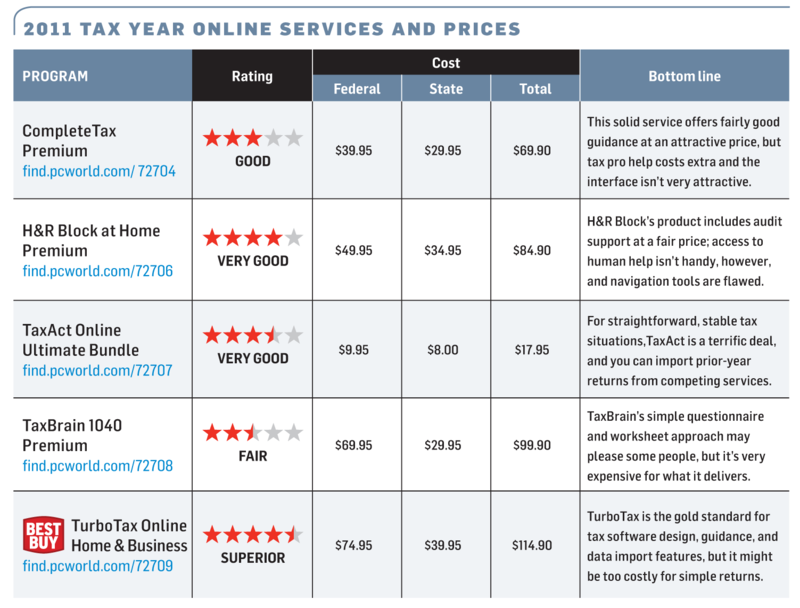 Chart: Five online tax services. TaxAct, which is by far the least expensive option ($18 to prepare and e-file returns for both federal taxes and one state's taxes), remains a great choice for people who have relatively simple tax situations and don't need much guidance. CompleteTax costs somewhat more than TaxAct and offers a little more help, while TaxBrain continues to charge dearly for its minimalist, worksheet-based approach. For a comparison chart of the tax services we evaluated, with relevant prices listed, click the image at left. Perhaps the best thing about tax sites is that you can try them before you buy: All five that we looked at will let you start a return and do everything short of printing or e-filing it, without charging you a dime. Remember, too, that people with an adjusted gross income (income after deductions) of $57,000 or less are eligible for free tax prep software and e-filing through the government's Free File website--and anyone who simply wants to fill out IRS tax forms online without third-party guidance can do so for free, also through the FreeFile program. Like most tax prep software and sites, TurboTax starts by asking about major life events with tax implications. But its list also shows off the software's slick graphic design. TurboTax remains the priciest of the online services. This year, using TurboTax Online Home and Business edition to prepare and e-file one state return and one federal return will set you back $115, compared to $85 for comparable services from archrival H&R Block at Home. But Intuit's venerable tax-prep software continues to set the bar for its thoughtful user interface and great data import features--and the addition of free, unlimited access to a tax professional (in case you can't find answers to your tax questions in the very helpful user forums) makes the price premium easier to swallow. TurboTax supports electronic import of W-2 (payroll), 1099 (investments), and--for the first time--1098 (mortgage interest) data from 400,000 employers, payroll services, and financial institutions, more than any other service. This feature saves time and tends to improve accuracy. Unfortunately, TurboTax Online doesn't support importation of 2010 returns prepared by competitors; it can only bring in information from a 2010 TurboTax return prepared online or with desktop software. Nor does the online service support importation of financial data from Quicken or QuickBooks. If this ability matters to you, consider using the desktop version of TurboTax, which does support transfers of information from competitors' PDF returns, along with QuickBooks, Quicken, and other financial data. TurboTax's slick, interview-based interface uses the GPS metaphor touted in Intuit's ad campaigns: Interview topics appear as billboards on a road. But the program gives you lots of ways to hop around, starting with a Tools button in the upper right area of the screen: Click it for access to a list of topics that you can navigate to. The GPS metaphor that TurboTax is using in its TV ads finds expression in the highway-and-billboard graphics scattered throughout the software. At the start of each section, you either choose a guided setup or click 'Explore on my own' to bring up a clickable list of subtopics. Finally, like most other tax prep services, TurboTax has a bookmark feature (which it calls Flags) that lets you identify pages you want to revisit, or return to ones you've previously flagged. Turbotax's flexible approach to navigation is particularly effective in its sole-proprietor (Schedule C) area, which many users will want to fill out in dribs and drabs. Finding a specific business expense page was much easier in TurboTax than in other services. I also appreciated how relatively painlessly the program handles business assets, making it easy to take the Section 179 option of completely writing off the purchase price of a new asset in the year you acquire it. TurboTax also does a fine job of explaining what you need to know about various business issues, providing essential information without drowning you in arcane details. Intuit has had years to perfect TurboTax; and while it can't completely remove the pain of doing your taxes, it continues to shine at mitigating the suffering. People whose tax situations are very simple may not be able to justify spending the extra money, but if you have lots of data to import and you need guidance (especially in connection with self-employment issues), TurboTax is well worth buying.